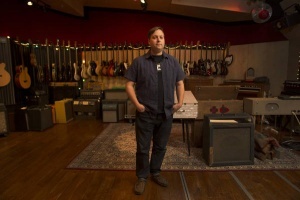 Scott Wiley is a music engineer and producer and owner of June Audio Recording Studios in Provo, Utah. He is a member of The Church of Jesus Christ of Latter-day Saints. He came to the technical side of music in his youth. He remembers asking for a four-track recorder for his eighth-grade graduation present. While working on a degree at University of Southern California in music recording, he worked for various studios, preparing for the work he does now. After graduation and marriage, he continued his studio work in the Los Angeles area. But dissatisfied with the lifestyle, he moved his family to Utah and opened June Audio in 2007. He and his wife now have five children. Wiley has worked with such performers as Kaskade, Sam Cardon, Alex Boye, David Archuleta, Neon Trees, Fictionist, The Lower Lights, The Moth & the Flame, Hilary Weeks, Mindy Gledhill, Cherie Call, Stephanie Mabey, and Sarah Sample. He plays a few instruments himself (guitar and bass) and houses a collection of guitars, drums, keyboards, and microphones. This page was last edited on 29 January 2016, at 15:43.